As of this writing, it’s been four hours since I left the theater after seeing The Muppets. And there is not an ounce of hyperbole when I say that I am still smiling and humming their famous tune, Manamana. In the updated muppet universe, the muppet theatre has fallen into disrepair. A wealthy oil tycoon, Tex Richman (Chris Cooper), has plans to buy the theatre, destroy it, and drill for oil. 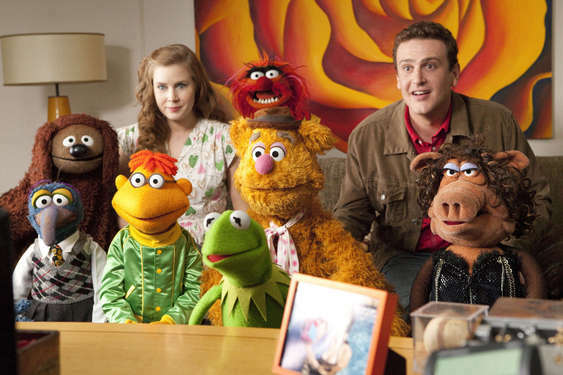 Muppet superfan Walter, touring the studio with his brother Gary (Jason Segel) and Gary’s girlfriend Mary (Amy Adams), stumbles upon the nefarious plot. The trio must then round up the old Muppet gang to raise enough money to save the theatre. When Jason Segel wrote the screenplay, he was charged with an extremely difficult task. On one hand, he was writing for a franchise that had crawled almost to a halt since their 1970’s and early-to-mid 1980’s heyday. He had to revive the franchise. But his characters were all already established. He couldn’t have them behaving in different ways, saying different things. 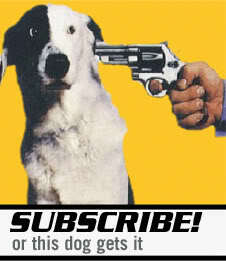 He had to use what was already there to make the franchise fresh to new audiences. And then there’s the nostalgia factor. There is a gigantic number of people who were weaned on The Muppet Show and subsequent movies. Those people are now the parents of the children that Segel had to draw to the theatre. Any misstep would leave an attentive fan base cold. Essentially, he had to make a beloved franchise new again while paying healthy homage to everything that franchise had done. Segel succeeded on every front. Walter speaks directly to anyone who grew up with the show. His love of the franchise is the same love that we all have. And the film is full of flourishes that pay direct homage to the heyday of the show. Every major and minor character is there, up to and including Beauregard the janitor. If you are a fan of the show, the nostalgia will wash over you. But it never ever feels stale in the slightest. 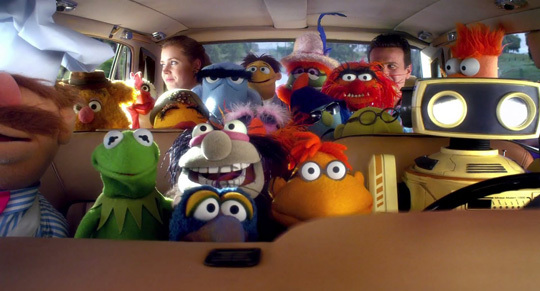 Segel’s screenplay is especially adept at embracing two elements of the original humor of The Muppets. The first is that they’re very topical. Buried in the charm of the lovable muppets is that the original run of the show possessed a healthy dose of satire, albeit good-spirited. The second is the meta nature of the muppets, especially in the first muppet movies. They constantly refer to specific plot points or the fact that their behavior would be bizarre if it was happening in real life. Segel’s film takes on both of these aspects with aplomb. But it’s all updated, with more current references. It possesses its own dash of humor, as well, never using the nostalgia and the original formula as any sort of crutch. Essentially, what Segel developed was a love letter to the muppets without completely ripping off the muppets or pandering to nostalgia. And it will resonate with audiences both young and old. Another part of the charm of the first muppet movies, and the show, was the steady stream of cameo appearances by stars of the era. Segel’s film even nods to it, with Kermit placing a call to the White House to speak to “President Jimmy Carter”. And it delivers. Cameos are made by Zach Galifianakis, Alan Arkin, Sarah Silverman, Jack Black, Ken Jeong, Whoopi Goldberg, Mickey Rooney, and several others. I’d be extremely remiss if I didn’t point out how great Segel and especially Amy Adams were as the lead characters who glued the movie together. The problem with me giving this review is that it’s impossible for me to do it with any objectivity. Just like Walter and millions of viewers of this movie, I was myself a Muppet superfan when I was a child. Even if this movie had been awful, I would’ve enjoyed it on at least a nostalgia level. I would’ve had an impossible time giving it a negative rating or review. Fortunately, Segel and crew made it easy on me. I didn’t have to deal with it because I smiled and laughed and loved it from start to finish. Then again, maybe that’s the point. There isn’t a single adult reviewer of the film who wouldn’t be in the exact same position. The charm, lovability, and pure genius of Jim Henson’s characters will all endure. They’re too magical not to. I just hope it plays as well with those who don’t have the nostalgia. I’m sure it’ll play well with fans and kids. But non-fans… I’m really not sure. I really want to see this now, which is odd because I didn’t before. But it just looks too awesome to pass up. This may be the beginning of a Muppets obsession. You can never go wrong trying out some of the clips from the original show on Youtube. I cannot wait to see this. I haven’t liked a Muppet movie since they took Manhattan, and even that one wasn’t my favorite. They’ve had some really bad movies since the first two. I hope this one does well enough that it gets a sequel. As one of the key targets you cited in your review (a parent who grew up on the Muppets), it makes me so happy to hear the film is being so critically lauded. I had hoped it was a film that would be done with love of the original subject matter. Very much so. I became a fan of Segel just because of how much a fan he obviously is of the Muppets. Ahh! The Muppets was good! Your life is complete! I’ve been talking like Fozzy Bear ever since. Seems to be good then. Really nice to hear. Now the waiting begins to find out if they will play it in cinemas over here. I am really looking forward to it! I think it goes international in February. Or at least the UK. Sorry John, but the appeal of the Muppets sort of escapes me. Glad to hear that this movie satisfies even a Muppet super-fan like you! It definitely helps to have grown up on them. I will try to catch it sometime soon! So I will be reading your review then and commenting with some more juicy elements!